We have a very large selection of various work wear here at Calendar Lady Promotions all waiting to wear your business details and company logo to help you stay advertised during these times of high competition. Zip-Off Sleeves And 4 Pockets On The Outside, 2 With Zipper And Taped Seams. 1 X 1 Rib Knit Cuffs And Bottom. Two Way Main Zipper And Removable Inside Fur Collar. Removable Fur Lining With Pocket And Hanging Loop..
Pongee Fabric Of 100% Polyester With Pvc Coating. Removable Fur Lining Of 100% Polyester. View more Embroidered Company Work Wear with Logo here. 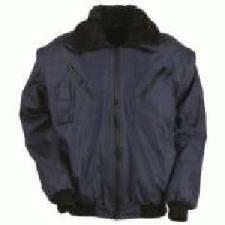 To find out more about our Company Jackets click here and fill in the contact form and we'll get straight back to you. Other promotional and personalised items besides our Company Jackets click here.